Lag BaOmer (Hebrew: לַ״ג בָּעוֹמֶר), also Lag B'Omer, is a Jewish holiday celebrated on the 33rd day of the Counting of the Omer, which occurs on the 18th day of the Hebrew month of Iyar. Another reason for why Jews celebrate Lag BaOmer is that it marks the day that the plague that killed Rabbi Akiva's 24,000 disciples came to an end, and for this reason the mourning period of Sefirat HaOmer concludes on Lag BaOmer for some people. Children watch Lag BaOmer bonfire in Tel Aviv, Israel. Some Jews call this holiday Lag LaOmer, which means "33rd [day] of the Omer", as opposed to Lag BaOmer, "33rd [day] in the Omer". Lag BaOmer is the traditional method of counting by some Ashkenazi and Hasidic Jews; Lag LaOmer is the count used by Sephardi Jews. Lag LaOmer is also the name used by Yosef Karo, who was a Sepharadi, in his Shulchan Aruch (Orach Chaim 493:2, and cf. 489:1 where BaOmer is inserted by a glossator). (The form Lag B'Omer ["33rd day of an Omer"] is also sometimes used, though it is not grammatically correct in this setting.) The Lubavitcher Rebbe, Rabbi Menachem Mendel Schneerson, writes in his Likkutei Sichos that a deeper reason for the term Lag BaOmer is that the Hebrew words Lag BaOmer (ל״ג בעמר, spelled without the "vav"), have the same gematria as Moshe (משה, Moses). He writes that Rabbi Shimon bar Yochai, whose yahrzeit is traditionally observed on this day, was mystically a spark of the soul of Moses. Entrance to the tomb of Rabbi Shimon bar Yochai and his son, Rabbi Eleazar. The origins of Lag BaOmer as a minor festival are unclear. The date is mentioned explicitly for the first time in the 12th century by Avraham ben Nathan in the Sefer Hamanhig (106). The Talmudist Meiri in his gloss to Yevamot 62b cites the Talmudic passage which states that during the time of Rabbi Akiva, 24,000 of his students died from a divinely-sent plague during the counting of the Omer. The Talmud goes on to say that this was because they did not show proper respect to one another. Meiri named Lag BaOmer as the day when, "according to a tradition of the geonim", the "plague" ended. After the death of Rabbi Akiva's 24,000 students, he was left with only five students, among them Rabbi Shimon bar Yochai. The latter went on to become the greatest teacher of Torah in his generation, and is purported to have authored the Zohar, a landmark text of Jewish mysticism. The Zohar calls the day of Bar Yochai's death a hillula. Rabbi Chaim Vital, the main disciple of Rabbi Isaac Luria and author of Etz Chaim, was the first to name Lag BaOmer as the date of Bar Yochai's hillula. According to the Zohar (III, 287b–296b), on the day of Bar Yochai's death, he revealed the deepest secrets of the Kabbalah. Lag BaOmer therefore became a day of celebration of the great light (i.e., wisdom) that Bar Yochai brought into the world. Nachman Krochmal, a 19th-century Jewish theologian, among others, suggests that the deaths of Rabbi Akiva's students was a veiled reference to the defeat of "Akiva's soldiers" by the Romans, and that Lag BaOmer was the day on which Bar Kokhba enjoyed a brief victory. During the Middle Ages, Lag BaOmer became a special holiday for rabbinical students and was called "Scholar's Day." It was customary to rejoice on this day through outdoor sports. Lag BaOmer has another significance based on the Kabbalistic custom of assigning a Sefirah to each day and week of the Omer count. The first week corresponds to Chesed, the second week to Gevurah, etc., and similarly, the first day of each week corresponds to Chesed, the second day to Gevurah, etc. Thus, the 33rd day, which is the fifth day of the fifth week, corresponds to Hod she-be-Hod (Splendor within [the week of] Splendor). As such, Lag BaOmer represents the level of spiritual manifestation or Hod that would precede the more physical manifestation of the 49th day (Malkhut she-be-Malkhut, Kingship within [the week of] Kingship), which immediately precedes the holiday of Shavuot. The tomb of Rabbi Shimon bar Yochai in Meron on Lag BaOmer. While the Counting of the Omer is a semi-mourning period, all restrictions of mourning are lifted on this 33rd day of the Omer. As a result, weddings, parties, listening to music, and haircuts are commonly scheduled to coincide with this day among Ashkenazi Jews. Families go on picnics and outings. Children go out to the fields with their teachers with bows and rubber-tipped arrows. Tachanun, the prayer for special Divine mercy on one's behalf, is not said on days with a festive character, including Lag BaOmer; when God is showing one a "smiling face," so to speak, as He does especially on the holidays, there is no need to ask for special mercy. The Sephardi custom is to continue mourning practices through the 33rd day of the Omer and celebrate on the 34th day of the Omer, or LaD BaOmer (ל״ד בעומר). Israeli boys collect wood for a Lag BaOmer bonfire. A wood pile awaiting Lag Baomer celebration. Another wood pile along the wadi near Rechov Sorotzkin street in Jerusalem. The most well-known custom of Lag BaOmer is the lighting of bonfires throughout Israel and worldwide wherever religious Jews can be found. In Meron, the burial place of Rabbi Shimon bar Yochai and his son, Rabbi Eleazar, hundreds of thousands of Jews gather throughout the night and day to celebrate with bonfires, torches, song and feasting. This was a specific request by Rabbi Shimon bar Yochai of his students. Some say that as bar Yochai gave spiritual light to the world with the revelation of the Zohar, bonfires are lit to symbolize the impact of his teachings. As his passing left such a "light" behind, many candles and/or bonfires are lit. The Bnei Yissaschar cites another reason for the lighting of bonfires. On the day of his death, Rabbi Shimon Bar Yochai said, "Now it is my desire to reveal secrets... The day will not go to its place like any other, for this entire day stands within my domain..." Daylight was miraculously extended until Rabbi Shimon had completed his final teaching and died. This symbolized that all light is subservient to spiritual light, and particularly to the primeval light contained within the mystical teachings of the Torah. As such, the custom of lighting fires symbolizes this revelation of powerful light. At the tomb of Rabbi Shimon, the honor of lighting the main bonfire traditionally goes to the Rebbes of the Boyaner dynasty. This privilege was purchased by Rabbi Avrohom Yaakov Friedman, the first Sadigura Rebbe, from the Sephardi guardians of Meron and Safed. The Sadigura Rebbe bequeathed this honor to his eldest son, Rabbi Yitzchok Friedman, the first Boyaner Rebbe, and his progeny. The first hadlakah (lighting) is attended by hundreds of thousands of people annually; in 2001, the crowd was estimated at 300,000. In 1983 Rabbi Levi Yitzchak Horowitz, the second Bostoner Rebbe, reinstated a century-old tradition among Bostoner Hasidim to light a bonfire near the grave of Rabbi Akiva in Tiberias on Lag BaOmer night. The tradition had been abandoned due to murderous attacks on participants in the isolated location. After the bonfire, the Rebbe delivered a dvar Torah, gave blessings, and distributed shirayim. Later that same night, the Rebbe cut the hair of three-year-old boys for their Upsherin. In Britain bonfires are lit; the London Fire Brigade reported in 2018 that it had responded to several bonfires throughout the night, one of which caused an explosion that injured several people. For many years, Rabbi Aaron Teitelbaum of the Satmar group, who was based in the US, said to his students that it was not customary outside of Israel to make bonfires, and he discouraged the students in his yeshiva from lighting bonfires on Lag BaOmer. However, in 2000 his father, Rabbi Moses Teitelbaum, the then-Grand Rabbi of Satmar, instructed his son to make a large bonfire in the Satmar enclave of Kiryas Joel, New York, US on the night of Lag BaOmer. In 2012 the Lag BaOmer bonfire in Kiryas Joel drew an estimated 50,000 participants. For Zionists (see section below), the bonfires are said to represent the signal fires that the Bar Kokhba rebels lit on the mountaintops to relay messages, or are in remembrance of the Bar Kochba revolt against the Romans, who had forbidden the kindling of fires that signalled the start of Jewish holidays. Another custom at the tomb of Rabbi Shimon bar Yochai is the giving of chai rotel (Hebrew: ח״י רוטל‎). The Hebrew word chai has the gematria (numerical equivalent) of 18. Rotel is a liquid measure of about 3 liters. Thus, 18 rotels equals 54 liters or about 13 gallons. It is popularly believed that if one donates or offers 18 rotels of liquid refreshment (grape juice, wine, soda or even water) to those attending the celebrations at bar Yochai's tomb on Lag BaOmer, then the giver will be granted miraculous salvation. According to Taamei HaMinhagim, many childless couples found success with this segula (propitious practice). This practice was also endorsed by Rabbi Ovadia miBartenura and The Shelah HaKadosh. The Bobover Rebbe, Rabbi Ben Zion Halberstam, sent a letter from Poland to his Hasidim in Israel asking them to donate chai rotel in Meron on this holy day on behalf of a couple that did not have children. Several local organizations solicit donations of chai rotel and hand out the drinks on the donor's behalf in Meron on Lag BaOmer. Nine months after Lag BaOmer, the Ohel Rashbi organization even invites couples who prayed at the tomb and had a child to come back to Meron to celebrate the births. A rabbi performs the traditional first haircut on a 3-year-old boy in Meron on Lag Baomer 1970. It is customary at the Meron celebrations, dating from the time of Rabbi Isaac Luria, that three-year-old boys be given their first haircuts (upsherin), while their parents distribute wine and sweets. Similar upsherin celebrations are simultaneously held in Jerusalem at the grave of Shimon Hatzaddik for Jerusalemites who cannot travel to Meron. Historically, children across Israel used to go out and play with bows and arrows, reflecting the Midrashic statement that the rainbow (the sign of God's promise to never again destroy the earth with a flood; Genesis 9:11–13) was not seen during Bar Yochai's lifetime, as his merit protected the world. In Israel, Lag BaOmer is a holiday for children and the various youth movements. It is also marked in the Israel Defense Forces as a week of the Gadna program (youth brigades) which were established on Lag BaOmer in 1941 and which bear the emblem of a bow and arrow. Lag BaOmer is a popular day for weddings among Ashkenazi Jews (Sephardi Jews hold weddings on Lad BaOmer, the 34th day of the Omer). For those who do not conduct celebrations between Pesach and Lag BaOmer, the date often marks the first opportunity for a wedding in the spring or early summer. A Lag BaOmer parade in front of Chabad headquarters at 770 Eastern Parkway, Brooklyn, New York, in 1987. The Lubavitcher Rebbe, Rabbi Menachem Mendel Schneerson, encouraged Lag BaOmer parades to be held in Jewish communities around the world as a demonstration of Jewish unity and pride. Chabad sponsors parades as well as rallies, bonfires and barbecues for thousands of participants around the world each year. 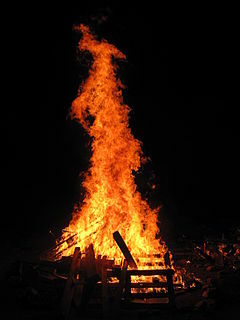 Several traditional songs are associated with the holiday; these are sung around bonfires, at weddings, and at tishen held by Hasidic Rebbes on Lag BaOmer. The popular song "Bar Yochai" was composed by Rabbi Shimon Labi (c. 1490–c. 1584), a 16th-century kabbalist, in honor of Shimon Bar Yochai. Other songs include "Ve'Amartem Koh LeChai", a poem arranged as an alphabetical acrostic, and "Amar Rabbi Akiva". Most Hasidic Rebbes conduct a tish on Lag BaOmer, in addition to or instead of a bonfire. A full meal is usually served, and candles are lit. It is traditional to sing "Bar Yochai", "Ve'Amartem Koh Lechai", and "Amar Rabbi Akiva". In Satmar, "Tzama Lecha Nafshi" is sung at the tish in addition to the other songs. Teachings of Rabbi Shimon Bar Yochai, both from the Talmud and the Zohar, are generally expounded upon by Rebbes at their tishen. In some Hasidic courts, the Rebbe may shoot a toy bow and arrow during the tish, and three-year-old boys may be brought to have a lock of hair cut by the Rebbe as part of their first haircut. A first-grade classroom in Tel Aviv in 1973 with holiday displays; the Lag BaOmer display showing Bar Kokhba is on the left. In modern Israel, early Zionists redefined Lag BaOmer from a rabbinic-oriented celebration to a commemoration of the Bar Kokhba revolt against the Roman Empire (132–136 CE). According to work published by Yael Zerubavel of Rutgers University, a number of Lag BaOmer traditions were reinterpreted by Zionist ideologues to focus on the victory of the Bar Kokhba rebels rather than their ultimate defeat at Betar three years later. The plague that decimated Rabbi Akiva's 24,000 disciples was explained as a veiled reference to the revolt; the 33rd day when the plague ended was explained as the day of Bar Kokhba's victory. By the late 1940s, Israeli textbooks for schoolchildren painted Bar Kokhba as the hero while Rabbi Shimon bar Yochai and Rabbi Akiva stood on the sidelines, cheering him on. This interpretation lent itself to singing and dancing around bonfires by night to celebrate Bar Kokhba's victory, and playing with bows and arrows by day to remember the actions of Bar Kokhba's rebel forces. This is how Lag Ba'omer became a part of the Israeli-Zionist psyche during the first years of Zionism and Israel. A clear distinction became evident between Jews and Israelis (sic) in the way the day was celebrated: The religious Jews lit torches in Rashbi's [Shimon bar Yochai's] honor and sang songs about him, while young Israelis, sitting around an alternative bonfire, sang about a hero "whom the entire nation loved" and focused on the image of a powerful hero who galloped on a lion in his charges against the Romans. In modern Israel, Lag BaOmer is "a symbol for the fighting Jewish spirit". The Palmach division of the Haganah was established on Lag BaOmer 1941, and the government order creating the Israel Defense Forces was issued on Lag BaOmer 1948. Beginning in 2004, the Israeli government designated Lag BaOmer as the day for saluting the IDF reserves. ^ "Dates for Lag BaOmer". Hebcal.com by Danny Sadinoff and Michael J. Radwin (CC-BY-3.0). Retrieved August 26, 2018. ^ The association of Lag BaOmer with the death of rabbi Shimon bar Yochai may be based on a printer's error. See Brodt, Eliezer. "A Printing Mistake and the Mysterious Origins of Rashbi's Yahrzeit". seforim.blogspot.com. Retrieved May 7, 2015. .
^ Walter (2018), p. 192. ^ "Count D'Omer". Ohr Somayach International. Retrieved April 28, 2013. ^ Cohen, Rabbi Tzvi (1985). Bein Pesach L'Shavuos (Hebrew). Chapter 17: Lag BaOmer, p. 301. ^ a b c d Feldman, David M. (2008). "Omer". Jewish Virtual Library. Retrieved April 28, 2013. ^ Miller, Moshe (2013). "Rashbi's Passing". chabad.org. Retrieved April 28, 2013. ^ Orlofsky, Rabbi Dovid (2013). "The Fire Within: Some thoughts on Lag B'Omer". Moshe Yehuda Institute. Archived from the original on June 30, 2013. Retrieved April 28, 2013. ^ a b Zerubavel, Yael. "Bar Kokhba's Image in Modern Israeli Culture", in The Bar Kokhba War Reconsidered: New perspectives on the Second Jewish Revolt against Rome, Peter Schäfer, ed. Mohr Siebeck, 2003, pp. 282–286. ISBN 3-16-148076-7. ^ "Jewish Prayers: Tahanun". Jewish Virtual Library. jewishvirtuallibrary.org. Retrieved April 11, 2019. ^ Travis, Rabbi Daniel Yaakov (April 29, 2010). "Mourning's End – Understanding Sefira and Lag B'Omer". Beyond BT. Archived from the original on May 1, 2013. Retrieved May 2, 2010. ^ a b Silberberg, Naftali (2011). "Lag BaOmer Traditions and Customs". chabad.org. Retrieved December 5, 2011. ^ Horowitz, Y. F. and Morgenstern, Ashira (November 24, 2010). "Seasons: The Bostoner Rebbetzin remembers and reflects on the occasion of the first yahrtzeit of Grand Rabbi Levi Yitzchak HaLevi Horowitz, ztz"l, 18 Kislev 5771". Mishpacha, Family First supplement, p. 52. ^ "Ten hurt in Stamford Hill Jewish festival explosion". BBC News. May 3, 2018. Retrieved May 3, 2018. ^ "Satmar Kiryas Joel Rabbi Aaron Teitelbaum Speech Against Lag BaOmer". YouTube. 1995. Retrieved May 15, 2014. ^ a b Amdurski, Noam (May 9, 2012). "50,000 Expected at Lag Ba'omer Celebration Tonight in Kiryas Yoel". matzav.com. Retrieved May 15, 2014. ^ a b "Lag BaOmer". The Knesset. 2010. Retrieved April 3, 2014. ^ "Lag Ba'Omer". Jerusalem Municipality. May 27, 2005. Archived from the original on June 1, 2012. Retrieved December 5, 2011. ^ a b "Over 500,000 Expected in Meron for Lag Ba'omer, 5769". matzav.com. May 11, 2009. Retrieved April 28, 2010. ^ a b "Chai Rotel Segulah". YeshuosRashbi.com. Retrieved April 14, 2013. ^ Rossoff, Dovid. "Meron on Lag B'Omer". The Jewish Magazine. Retrieved April 28, 2010. ^ Prero, Rabbi Yehudah (2007). "Lag B'Omer". torah.org. Retrieved April 28, 2013. ^ "Lag B'Omer: A day for weddings". Jewish Wedding Network. 2009. Archived from the original on January 26, 2013. Retrieved December 5, 2005. ^ "Parades in Central Israel Draw 1,000 Children". chabad.org. May 12, 2009. Retrieved April 28, 2010. ^ Grodnitzky, Reuvena Leah (April 28, 2010). "From South Africa to Finland, Excitement Builds for Unity Parades". chabad.org. Retrieved April 28, 2010. ^ Goldwurm, Hersh (1989). The early acharonim: biographical sketches of the prominent early rabbinic sages and leaders from the fifteenth-seventeenth centuries. Mesorah Publications, Ltd. p. 93. ISBN 0899064884. ^ Vining, Peggy A. (2008). Galatians and First-Century Ethical Theory. ProQuest. p. 137. ISBN 0549956115. ^ Barzilai, Shmuel (2009). Chassidic ecstasy in music. Peter Lang. p. 104. ISBN 3631584520. ^ Lau, Benjamin (May 3, 2007). "Portion of the Week / The fires of Lag Ba'omer". Haaretz. Retrieved April 16, 2013. ^ "Lag B'Omer". Ynetnews. May 13, 2008. Retrieved May 5, 2012. ^ "Cabinet Communique". Israel Ministry of Foreign Affairs. May 6, 2007. Retrieved December 5, 2011. Walter, Moshe (2018). The Making of a Minhag: The Laws and Parameters of Jewish Customs. Jerusalem: Feldheim Publishers. ISBN 9781680253368. Wikimedia Commons has media related to Lag Ba'omer.